The AA Navigator 2006 satellite navigation system includes UK and Ireland map data and also live traffic alerts including current traffic speed. The 3.5-inch QVGA TFT colour screen provides turn by turn voice instructions. AA Navigator 2006 has been discontinued. The AA Navigator 2006 includes full street-level mapping. It has 3D map mode for a perspective view of the road ahead and 1,000's of points of interest (POI's) including AA hotels and restaurants. AA Traffic information is broadcast 24/7, 365 days of the year and is received by the radio receiver, providing you with detailed traffic information along your route. You then have the option of automatically rerouting around any traffic incidents. The traffic information you receive is free for as long as you have the unit, with no further fees or subscriptions. The radio receiver works completely independently from the car radio. The AA Navigator has a built-in MP3 player with headphones and provides real-time traffic warning system with free lifetime traffic subscription included (UK only). The in-car power cable incorporates a radio traffic receiver. The external antenna for the traffic receiver is easy to install. The windscreen mount provides a permanent fixing point and the integrated speaker provides voice guidance. 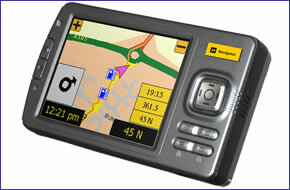 The AA Navigator 2006 256 MB SD card incorporates AA Navigator software and maps of Great Britain and Northern Ireland. Also included is a lifetime license to the AA's traffic service, with no additional fees or subscriptions.